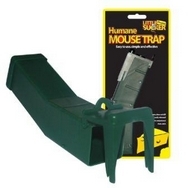 Mouse Traps - Little Sucker Single Live Catch Mice Traps are NO KILL - NO POISON traps for use inside the house or outside in the garden. Easy to set and ready for a quick humane capture of problem mice. Simply place the mouse traps where you have seen evidence of mice to eradicate a mice infestation.